Today we took our first summer birding trip down to Cape May Point State Park. It was a really hot day, around 90 degrees, but we still managed to see 30 species birds. On the drive down it was pretty foggy, and it was still pretty misty by the time we got down to the Point. 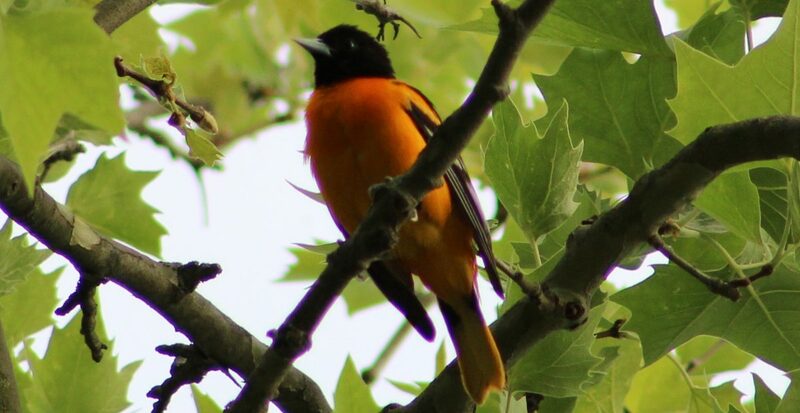 Bird species along the main trail included Mute Swans, Mallards, Tree Swallows, Common Yellowthroats (heard), Forster’s Terns, Laughing Gulls, Ospreys, Northern Mockingbirds, Purple Martins, Canada Geese, an Eastern Kingbird,and Red-winged Blackbirds. There were also hundreds of tiny toads hopping across the trail. We had a few fun surprises on the beach. Two Brown Pelicans flew by over the ocean. After I took the above picture the pelicans skimmed very close to the ocean’s surface. They used an aerodynamic phenomenon call the “ground effect”. As the pelicans fly close to the water with their full wingspan, the air is “funneled” between their wings and the ocean surface. This effect allows the birds to stay aloft and increases efficiency. Eventually the bird must gain some speed by flapping and slightly ascending in order to continue its glide. Many birds use the ground effect over water, but this principal also works on land. Another interesting thing to note about these Brown Pelicans: the bird on the left is an adult and the one on the right is immature. You can see the whitish-yellow of the adult’s head that the immature bird lacks. We also spotted pods of dolphins! They were relatively close to the beach, and would occasionally leap out of the water (wish I captured that in a picture!). There were also many pairs of American Oystercatchers. Some pairs were just strolling along the beach together, while others were guarding/sitting on eggs. This pair has a banded Oystercatcher, so I’ll submit my band findings to the American Oystercatcher Working Group and let you know what I find out. We were also really lucky to catch a glimpse of this couple’s two eggs (from a safe distance behind the barrier zooming in with the camera of course!) It was our first time seeing American Oystercatcher eggs. Our final beach surprised was a Sanderling in breeding plumage. It was all by itself, so I wonder where its flock mates went. Sanderlings are usually at the shore in the winter, so I think this little guy missed the memo that its summertime now. Our misty Cape May trip was a great way to start off our summer birding. Happy Earth Day! To celebrate, we spent the afternoon birding in Cape May, NJ. At the Ponds: Green-winged Teals, Blue-winged Teals, Northern Shovelers, Forster’s Terns, Great Egrets, Tree Swallows, Purple Martins, Mute Swans, Bufflehead, Gadwalls, American Coots, Osprey, Field Sparrows, Yellow-rumped Warblers, Palm Warblers, Savannah Sparrows, Herring Gulls, Great Black-backed Gulls, female Red-breasted Merganser. Also saw a Muskrat. One of my favorite moments of the day took place on the way back to the parking lot. There were 2 Northern Mockingbirds doing the “wing flash display”. In this display, the mockingbird will open its wings to show their bright white wing patches. Some speculate that this movement is used to startle insects. However, even mockingbird species without white patches will use the move, so people are still not quite sure the purpose of the display. I wrote about the wing flash display last year, so it was cool to see it in person! Another one of my favorite things that happened today were DOLPHINS! I saw dolphins in the wild for the first time ever! I was ecstatic to see them, as I have loved dolphins since I was a kid. Overall we observed 46 bird species and two mammal species (muskrat and dolphin). It was a lovely afternoon in Cape May :-). While many Americans were out shopping on Black Friday in crazy crowds, Dave and I were among the flocks of water in Cape May. Last Sunday we went to Barnegat Lighthouse SP with the goal of seeing the winter waterfowl. It turns out we picked the windiest day to go (40+ mph winds!). We didn’t see much more than Brants, many gull varieties, Forsters Terns, and a few Sanderlings hiding from the wind behind rocks. No waterfowl to besides Brants to be seen, and I don’t blame them for not being around with the rough waters and high winds. It was still a fun trip, but we more than made up for the lack of waterfowl last week with today’s trip. We started the morning at Cape May Point State Park (CMPSP) where we saw 7 species of waterfowl. They were Mallards, Gadwalls, Mute Swans, Hooded Mergansers, Bufflehead, American Wigeons, and Canada Geese. Interspersed between the waterfowl were American Coots. Many people think that Coots are similar to ducks, but these species are not even in the same family. Coots belong to the family Rallidae (while ducks are in the family Anatidae) and are more closely related to rails and cranes. American Coots also lack webbing on their feet and instead have comically large lobed toes. Other birds at CMPSP included Yellow-rumped Warblers, an Osprey, Pied-billed Grebes, a Ruby-crowned Kinglets, Double-crested Cormorants, and Dark-eyed Juncos. We took the connector trail into South Cape May Meadows, where we saw even more waterfowl. Waterfowl included Ring-necked Ducks, Ruddy Ducks, a drake Northern Pintail, 3 female Surf Scoters, and more of the other species observed at CMPSP. At this location we spent most of our time walking on the beach instead of through the meadow itself. On the beach there were large groups of Greater Black-backed Gulls and Ring-billed Gulls. Sanderlings ran along the crashing waves and a few Black-bellied Plovers joined them. Out over the ocean large rafts of Scoters flew by, though it was hard to identify which kind with how far out they were. We also saw a few Red-throated Loons. Like CMPSP, we found a lot of Yellow-rumped Warblers on the trails to and from the beach. After exploring the Point and the Meadows, we tried a new birding area: Cape May National Wildlife Refuge. Cape May NWR is actually split into 3 units. The Great Cedar Swamp Division is near Upper Township, the Delaware Bay Division is in Middle Township, and Two Mile Beach Unit is in Lower Township. We decided to check out Two Mile Beach. At Two Mile Beach we saw tons of Dunlins, Sanderlings, gulls, some Black-bellied Plovers, and some Red-throated Loons. I didn’t take any pictures, but it was a nice way to end our day. I would certainly like to check out the other two units during future trips. I’m so glad that we were able to spend some time with the birds down in Cape May. I certainly enjoyed spending my time among the large waterfowl flocks than with the crazy shopping crowds! Wood Storks are primarily found in Florida and South America, but can also be in other Southeastern/Gulf Coast states certain times of year. They are considered rare outside their range, so a Wood Stork in New Jersey is a special treat! Adult Wood Storks are bald, so this bird is a juvenile since it has brown head feathers. This particular Wood Stork has been around Cape May and showing up on the NJ Rare Bird List for the last few weeks. I checked the list on Saturday night and there were 22 sightings, but over a few different Cape May locations, so I wasn’t sure where it would be. The first destination for our trip was Cape May Point State Park, where it was previously seen around the Hawk Watch Platform. We were driving past Lake Drive, when the car in front of us (who’s license plate happened to be “SAWWHET” as in saw-whet owl haha) started randomly pulling over. Dave was driving so I looked to my right and saw a few birders looking up at a tree. And there was the Wood Stork. Dave quickly turned the corner onto Lake Dr. We quietly parked an made our way to the other birders. The Wood Stork was sitting up on a tree preening. It was so beautiful, especially its eyes. It would interrupt its preening every so often to look back at us, almost as if it was posing for our photographs. Then it would preen again and loudly shake its feathers back into place. It was a fascinating bird to watch, and I’m thankful we had the opportunity to spend some time with this magnificent Wood Stork. Once we arrived at the Point, the sound of a familiar friend echoed through the air. I was happy to hear that the Northern Bobwhites from our last trip were still around, although we didn’t actually see them today. At the ponds near the Hawk Watch Platform there were over 20 Mute Swans, Mallards, Tree Swallows, and a Great Egret. We also were able to watch a number of Northern Mockingbirds fly around with each other through the bushes and shrubs. Other birds at the Point included a Yellow Warbler, Pine Warblers, a Double-crested Cormorant, and a Snowy Egret. We took the connector trail into South Cape May Meadows. It was quieter for us than in the past, but we still managed to see some birds. These included another Yellow Warbler, Carolina Wrens, a Black Vulture, a Turkey Vulture eating a dead gull, a Cooper’s Hawk, Mourning Doves, more Mockingbirds, and a Ruby-throated Hummingbird. I’m so happy that I had a chance to see the Wood Stork and was able to have a wonderful birding day with Dave. I couldn’t have asked for a better way to spend my birthday. Hi friends! I received an update from the American Oystercatcher Working Group about T2, who we spotted for the second year in a row at Barnegat Light State Park. T2 was banded on Island Beach State Park (which is on the barrier island directly north of Long Beach Island). T2 was banded on September 19, 2007 and spends its winters in Cedar Key, Florida, which is about a 1,050 mile migration one-way from Barnegat Light. Pretty cool to get to know a bird personally, right? This past Friday (June 16), Dave and I took a trip to Cape May. We spent some time at South Cape May Meadows (SCMM) and Cape May Point State Park (CMPSP). SCMM and CMPSP actually connect through a path. We made our way through the meadow with the intent of taking this path, but it turns out it was closed off. The connecting path is right before entering the beach, so we decided to explore the beach instead. It turns out the path being closed was a good thing, because we had the opportunity to watch some nesting Least Terns. Least Terns are the smallest of the North American Tern species, standing only at about 9 inches tall. In breeding plumage, Least Terns have unique bills because they are yellow with a black tip, as opposed to orange or black of other terns. Least Terns also have a white forehead and two dark primary feathers. There were a few pairs either sitting on eggs, flying around to get food for their mate, or some defending their nests. We watched one one breeding pair repeatedly dive bomb an American Oystercatcher pair, who quickly got the message that they weren’t welcome in that spot. It was the first time we had the chance to see any sort of nesting tern. They were fascinating to watch. If you look closely to the picture on the right of the tern standing, you can see its 2 speckled eggs behind the sticks. Throughout our walk we kept seeing an Oystercatcher pair. Eventually we saw one of them sitting on their nest. We were observing this oystercatcher from a distance when its mate came from the other direction and walked right up to us. This Oystercatcher had bands which read M3. Before walking off Dave was able to get some good pictures of M3’s metal band, so I submitted a report about M3 to the Oystercatcher Working Group as well. M3 was banded on Avalon Beach, NJ on June 26, 2009. It migrates over 670 miles one way to spend the winters at Cape Romain National Wildlife Refuge in South Carolina. Other birds we saw at the Meadows included at least 8 Ospreys, Common Yellowthroats, Black Skimmers, a Willet, and Great Black-backed Gulls to name a few. We drove over to CMPSP to see what we would find there. It was pretty quiet bird-wise at the Point since there were more people around. From the Hawk Watch platform we saw 20 Mute Swans (never saw that many at once! ), Great Egrets, Canada Geese, Mallards, House Finches, and Red-winged Blackbirds. We were getting tired, so we decided we were only going to walk up the path a little bit then head back to the car. We didn’t expect to see too much. On the way back, Dave paused. “Is that…a Bobwhite?”. I listened closely. Yep. Our ears weren’t playing tricks on us. It was a Northern Bobwhite. A Bobwhite is not quite who we expected to hear at the beach since they tend to live in forest or brushy habitats. Then I remembered that people were reporting Bobwhites here at the Point on the NJ Rare Bird List. Some people say they were released there, which is very likely. We started walking towards the sound when a cute, plump brown bird popped out from the grass. The next moment made the whole trip for me. It ran right at us, stopped, and started making little mumbling sounds at us. It was adorable to watch it run around. It quickly ran back into the grass only to emerge onto a large sand pile a few moments later. Then its friend showed up on another sand pile and began to make the “bob-WHITE!” call. The original Bobwhite wasn’t too happy with the other’s appearance though, because it ran down the sand pile and waddled straight down the path until we couldn’t see it anymore (I couldn’t help but think of Forrest Gump, “Run, Bobwhite, Run!” hahaha :-P). The Bobwhites were really amusing, and a fun way to end our Cape May trip. On Wednesday, Dave and I made our way down to Cape May for the second time. We went to two locations: Cape May Point State Park and South Cape May Meadows. The two parks actually connect, so it was easy to explore both locations. We arrived at Cape May Point mid-morning. It was in the low 4os, which to me is perfect winter birding weather. The first stop was the Hawk Watch platform, which I sometimes see listed on as a location on the NJ Rare bird list. No rare birds today, but the lake was full: Mute Swans, Mallards, Northern Shovelers, Hooded Mergansers, 2 Great Blue Herons, Double-crested Cormorants, Northern Pintails, Ruddy Ducks, Canada Geese, and even a male Gadwall (the first life list bird of the day). There are a few small ponds that dot the trail. At one of them we found 4 Mallards swimming together. One looked a little unusual though. He had some Mallard features; such as the curly black tail and yellow bill, but he only had a partial green head and lacked the white neck ring. He clearly is some sort of hybrid, which is common among ducks. Upon further investigation on the Cornell Lab’s All About Birds website, I found that he may possibly be a Mallard and American Black Duck hybrid. This hybrid features darker plumage and a partially green head. The next pond over was a small group of Bufflehead (who I just featured for Waterfowl Wednesday). Buffleheads tend to stay in small groups as opposed to large flocks. They were swimming closely together and sometimes would seem to dive at the same time. There were also 4 American Widgeons (life list bird #2). Males have white and green heads while females have gray-brown heads with a dark smudge around the eye. They kept going over to the 2 Mute Swans, almost swimming into them at times. While watching the Widgeons and Buffleheads, a small gull flew overhead. It was a graceful and skillful flyer. Everyone once in awhile it would dive down to the water, and just as easily maneuver its way back into the air. I finally got a good look at it, and it wasn’t our usual gull: it was a non-breeding Bonaparte’s Gull (life list #3)! It had a small black dot on each side of its head. This gull was a 1st winter Bonaparte’s. It had black wing tips and narrow dark patches on its upper wings. He gave us a pretty cool flight show, before flying off to a new pond. We continued on our way to the connector of the Point and South Cape May Meadows. We didn’t spend too much time in the Meadows, but we did get to explore some of the same ponds that we saw on our last Cape May trip. As expected there were large flocks of waterfowl: Mallards, Shovelers, Pintails, Ruddys, Buffleheads, and more Swans. The was a species that we didn’t expect to see: Tree Swallows. I though they would all be gone by this point, but there were a decent amount of them flying over the pond. There were also a large number of Turkey Vultures. They found a carcass of a gull, so they were having a feast across the pond. We did find one other gull at this pond: over on the side we were on. He looked pretty worn and a little chubby. I’m not sure what kind of gull it was, but we joked that maybe he looked kind of sad because his friend was being eaten by vultures. As we were listening to some Carolina Wrens sing, a flock of quick, small birds flew into nearby trees. It was a flock of Yellow-rumped Warblers. They were eating little white berries. They were quick, but Dave ended up getting a really great picture of one. We didn’t see anything new on the trip back to the car, but we saw a nice variety of species on our trip. It has been a great month for waterfowl: we added 6 new species to our life list over the past couple of weeks. I’m glad we had a chance to return to Cape May for some winter birding. I hope to visit Cape May again for the spring migration. Have you gone winter birding yet? If you have tell me about it in the comments. We finally did it! Dave and I took a trip to Cape May, NJ to go birding. Birding is a big deal in Cape May. New Jersey is part of what is called the Atlantic Flyway, which is a migration route use by birds on the Atlantic Coast. There are 4 flyways in the United States; the other 3 are Pacific, Central, and Mississippi. Due to its location, Cape May experiences hundreds of thousands of birds during spring and fall migrations. New Jersey Audubon headquarters and the Cape May Bird Observatory are stationed here, and there are tons of “birding hotspots”. Cape May is the host of The World Series of Birding and two annual migration festivals (fall and spring). It’s a birder’s paradise. People flock (pun intended) to Cape May for birds. Dave and I visited 3 different locations . Our first stop was Higbee Beach Wildlife Management Area.We were right in time to watch the Cape May-Lewes Ferry take off, which shuttles people from New Jersey to Delaware. It was a pretty quiet day at the beach. We spotted some gulls, terns, and cormorants flying across the bay. On the beach was a flock of Sanderlings with some Semipalmated Plovers mixed in. It’s fun to watch them scurrying around the sand trying to avoid the waves. There was a trail that went through the forest nearby, but we didn’t hike long since it was overgrown. Our second stop was the Cape May Bird Observatory Northwood Branch. There are two branches of the CMBO, but this one was a store. You can pretty much find any birding supply or accessory there: binoculars, spotting scopes, books, feeders, nest boxes, clothing, and artwork. The staff was knowledgeable about great birding locations and they were watching the Cornell Lab’s Texas Hummers. I ended up buying myself a print by artist David Kiehm of a Pileated Woopecker (longtime readers know about my love for Pileateds) called “Lunch Counter”. You can check out his amazing artwork at Dead Drift Studio at this link. Our last stop of the day was South Cape May Meadow, which is run by The Nature Conservancy. The trails take you through marsh meadows with small ponds interspersed and leads to the beach. The first section of the trail featured Mute Swans, Canada Geese, Mallards, American Black Ducks, Semipalmated Plovers, Semipalmated Sandpipers, Tree Swallows, and some Ospreys. The Mute Swans were very close to us and beautiful to watch. Farther down the trail we came to a second pond. There were more Mute Swans, but then we had some surprises. A Pied-billed Grebe was popping in an out of the water. Then four American Oystercatchers arrived. I was thrilled to see them. They are one of my favorites, and I haven’t seen them since June. A small flock of Snowy Egrets arrived. One of them continued to hover and it seems like he wasn’t sure where to land. He was quite a sight to watch. I was glad that I was able to get some clear pictures of him. Other birds we saw at this pond were Black Skimmers, more Osprey, Glossy Ibis, and Seimpalmated Sandpipers. We also had a great view of the Cape May Lighthouse, which is at a park down the street. There were more trails to explore, but unfortunately we had to head home at one point since we live an hour and a half away. We will certainly return to Cape May (especially The Meadows) during fall migration. There is so much to see and do there. Next time I would like to explore the Cape May National Wildlife Refuge. I’ve been to Cape May in the past for other reasons, but this was my first birding specific trip. Have you been birding in Cape May, NJ? If you have tell us about your experience in the comments! Don’t forget, if you have a specific bird or topic you want me to write about I would love to hear your suggestions. Author BirdNationPosted on August 25, 2016 August 26, 2016 Categories UncategorizedTags beauty, bird flocks, bird watching, Birds, Cape May Bird Observatory, Cape May birding, Cape May lighthouse, Cape May NJ, cape may- lewes ferry, Higbee Beach Wildlife Management Area, Jersey Shore birds, migration, mute swan, New Jersey birds, North American birds, sanderlings, snowy egret, South Cape May Meadows, South Jersey birds4 Comments on Cape May! Sherry Felix on We’re Migrating!